A BUBBLING CAULDRON: Costa Mesa Television Is Moving! Yep, the City of Costa Mesa announced today, HERE, that Costa Mesa Television (CMTV) is moving to Channel 3 from Channel 24 on Time Warner Cable. It will remain on Channel 99 on ATT U-Verse. This shift apparently recognizes the high quality of programming produced by Dane Bora and Brad Long at CMTV and, according to Bora, puts CMTV in a much more advantageous position on your TV tuner. This change begins Wednesday, April 10th and, according to the press release, the first event to be televised live on Channel 3 will be the City Council meeting on Tuesday, April 16th. Onward and upward for this outstanding production crew. Word is that more new, exciting coverage is on the way. Is that the OC Fair giant steer "Babe" wearing the SC jersey in the photo? 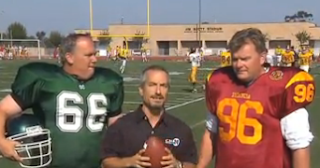 if you were in tune with Costa Mesa you might recognize it as a jersey from Estancia HS. I would tell you where the green one is but it would be best for the next step in your education to find out for yourself. check back with your guess. we will tell you if you are correct. so far, 0 for 1. sometimes common sense is blinded by hate. try relaxing, slowing down on the comments until you have done your homework, etc. right alf? is this well said sk? Bootlicker, your common decency is blinded by hate. There's no bottom to your well of bile and spite –and your attempts at humor fall flat. I've noticed your comments getting more mean spirited and petty as the weeks go by. why? Are you as unhappy a person as you seem? I think you are pretty confused. I feel compassion for you because you ooze insecurity, but wow you sure are a toxic dump. I'll be breathlessly watching for whatever poison dart you aim my way, you poor sick puppy. Back on topic, Brad and Dane: you are awesome, talented and make it all look so easy. Thanks for keeping the cameras cranking and being so utterly professional. I'll be watching our CC meetings on Channel 3 now. Our CMTV team is great- I'm glad they are moving up. Chairman's decency and truthfulness left the building a long time ago. Now it's his sanity that is circling the drain. He is absolutely obsessed with a few women commenters here. He mentions them constantly and carries on fake conversations with them. and gericault, all that espn had to do was read the word Estancia on the jersey before calling it USC. too much to expect? right sk? "all that espn had to do was read the word Estancia on the jersey before calling it USC"
Sorry Estancia fans. As I get older my world view keeps advancing past high school. I'll get a golf cart, let my wife support me, lick extremist boots, and try to do better. real men know football, even at high school level. sportswest, are you talking about the "real man" that is pretending to still be a child playing at football? Or the one that is actually working and earning money, making living as a teacher? Enough! We support Mensy playing football and blowing off steam so he won't have to get aggressive with airport clerks and school teachers. He's probably immune to head trauma by now. No JW, he's trying to snark at me. It's a slam against the Estancia Drama program and the hundreds of volunteer hours those boosters contribute. See Drama is gay...and my daughter shouldn't have wasted her time starring in plays when she should have been playing football. It's a Central Valley thing. Football helps make stronger farm workers. Both take place on fields. Aunt Peggy was disliked because she wouldn't play football and read all the time. "Book Larnin'" and "Drama" is for weirdos. Look at the ratings for the NFL vs. PBS. Why spend a lot of time following little words on a piece of paper when you can be out in the fresh air thumping other people? And, as Stevie shows, many people play football past 50; reading stops at the end of high school or 8th grade. I'd say the Estancia drama department has a MUCH stronger track record than the football team, and not just this year - and I'm a fan of both, so I guess in some people's view that makes me bi??? Couldn't resist. That's coming from someone who graduated with the last (and pretty sure only) EHS grad to carry a clipboard in the NFL (but never throw an actual pass in a regulation game), and even played Pop Warner with him as well (or Junior All-American as it was called back in the 70s - Go CM Condors!). On top of that, he even became a Costa Mesa cop later. Can't make this stuff up. So you have a pro football player from Estancia (good) who became a pension-loving, money grubbing public employee/union guy (very bad). Oh, the internal conflict this must cause some. Wrong sport, Just Wondering. Rich Amaral played baseball for the Mariners, and Jeff Gardener, another EHS grad, for the Mets and Padres. Correct answer is Jeff Graham, class of '84, then Long Beach State before being drafted by the Packers (if my memory is correct).